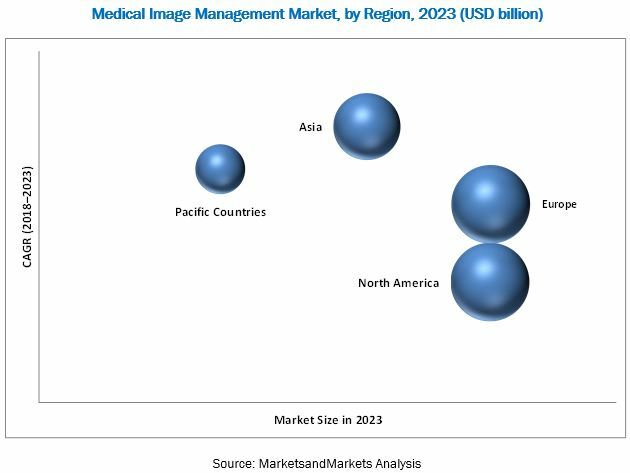 [223 Pages Report] The medical image management market is projected to reach USD 4.40 billion in 2023 from USD 2.86 billion in 2017 at a CAGR of 7.7% during the forecast period. The base year considered for the study is 2017 and the forecast period is from 2018 to 2023. The study estimates the medical image management market size for 2018 and projects its demand till 2023. In the primary research process, various sources from both demand and supply sides were interviewed to obtain qualitative and quantitative information for the report. 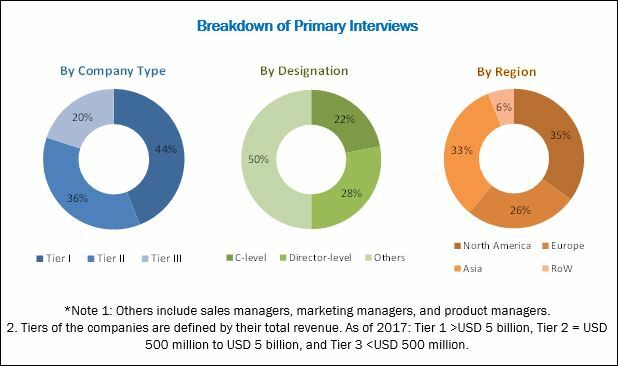 Primary sources from the demand side include various industry CEOs, vice presidents, marketing directors, technology and innovation directors, and related key executives from the various players in the medical image management market. For the market estimation process, both top-down and bottom-up approaches were used to estimate and validate the market size of the medical image management market as well as to estimate the market size of various other dependent submarkets. All possible parameters that affect the market covered in this research study have been accounted for, viewed in extensive detail, verified through primary research, and analyzed to get the final quantitative and qualitative data. This data was consolidated and added to detailed inputs and analysis from MarketsandMarkets and presented in this report. Some of the secondary sources used for this report include Radiological Society of North America (RSNA), The Association for Medical Imaging Management (AHRA), Medical Imaging and Technology Alliance (MITA), Australian Diagnostic Imaging Association, National Health Service (NHS), Journal of Medical Imaging, International Consortium for Medical Imaging Technology (ICMIT), European Journal of Radiology, and The Asian Oceanian Society of Radiology (AOSR). The medical image management market is marked by the presence of several big and small players. Prominent players offering medical image management products include McKesson Corporation (US), GE Healthcare (US), Fujifilm Holdings Corporation (Japan), Merge Healthcare Inc. (US), Agfa-Gevaert Group (Belgium), Philips Healthcare (Netherlands), Siemens Healthineers (Germany), Carestream Health, Inc. (US), BridgeHead Software (UK), Novarad Corporation (US), Mach7 Technologies Ltd. (US), and INFINITT Healthcare Co., Ltd. (South Korea). The medical image management market is projected to reach USD 4.40 billion in 2023 from USD 3.04 billion in 2018 at a CAGR of 7.7% during the forecast period. The growth of the market is driven by the technological advancements in diagnostic imaging modalities and image management software, growing investments in the medical imaging market, government initiatives to encourage EMR adoption, increasing usage of imaging equipment, and the growing adoption of image management systems by small hospitals and imaging centers, are factors driving the growth of the medical image management market. The report segments the medical image management market by product, end user, and region. Based on products, the medical image management market is segmented into PACS, VNAs, AICA, and enterprise/universal viewers. The PACS segment is expected to account for the largest share of the market in 2018. Factors such as technological advancements in PACS: adoption of PACS in new imaging segments such as endoscopy, ophthalmology, mammography, and oncology; growing adoption of PACS by small hospitals and imaging centers; and government initiatives encouraging healthcare IT adoption are driving the growth of the PACS segment. On the basis of type, the PACS market is segmented into radiology PACS, cardiology PACS, and other departmental PACS which include PACS solutions for specialties such as ophthalmology, pathology, oncology, radiotherapy, endoscopy, and dentistry. In 2018, the radiology PACS held the largest share of the market as the radiology department of a hospital is where a majority of the imaging studies are handled, managed, and stored. The medical image management market is segmented on the basis of end users into hospitals, diagnostic imaging centers, and other end users. In 2018, the hospitals segment is expected to account for the largest share of the global medical image management market. The rising patient population, growing awareness about the benefits of early disease diagnosis, increasing digitization of patient data, and rapid growth in EMR adoption are some of the major factors responsible for the large share of the hospitals segment in the market. The market is dominated by North America, followed by Europe. The dominance of the North American market is attributed to factors such as the large number of imaging centers in this region, ongoing research activities, and rapid adoption of technologically advanced imaging systems. Additionally, government initiatives towards digitization and increasing adoption of EHR/EMR and data storage & exchange solutions are additional factors driving the adoption of medical image management in this region. While the medical image management market represents significant growth opportunities, market growth may be hindered due to the high implementation and maintenance costs of these solutions, budgetary constraints, and the longer product life cycle of VNA. The medical image management market is marked by the presence of several big and small players. McKesson Corporation (US), GE Healthcare (US), Fujifilm Holdings Corporation (Japan), Merge Healthcare Inc. (US), Agfa-Gevaert Group (Belgium), Philips Healthcare (Netherlands), Siemens Healthineers (Germany), Carestream Health, Inc. (US), BridgeHead Software (UK), Novarad Corporation (US), Mach7 Technologies Ltd. (US), and INFINITT Healthcare Co., Ltd. (South Korea) are some of the prominent players in this market. 10.13 Infinitt Healthcare Co, Ltd.